"One does not have to be of a specific spiritual belief to use or get the benefits of this medicine. Recognized by native tradition as a “teacher plant” Ayahuasca facilitates holistic healing and self discovery, far beyond the frontiers of any conventional treatment." 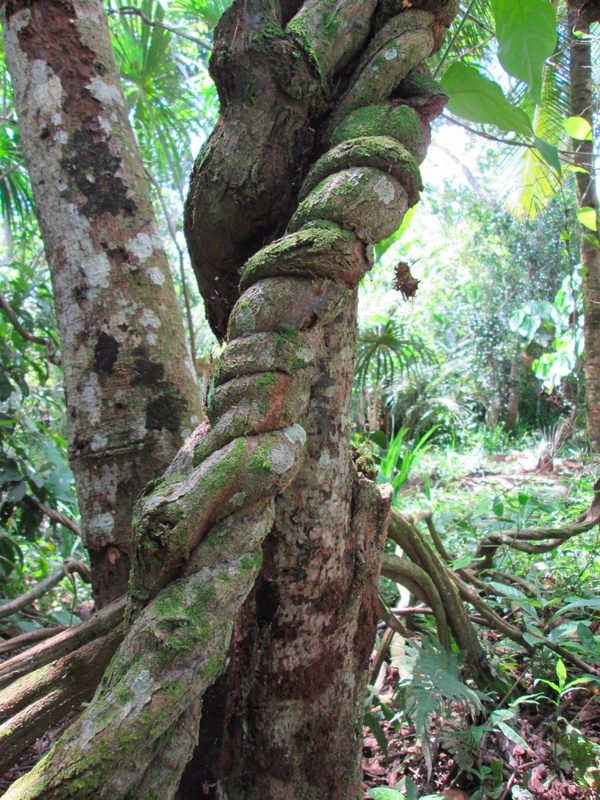 Ayahuasca (Banisteriopsis caapi) is a vine of the jungle, which grows in the entire Amazonia, from Columbia to Peru, Bolivia, Brasil and Guyana. It is known to and respected by all indigenous peoples as a healing plant or master “teacher plant” and represents the basis of their traditional medicines. Ayahuasca is boiled together with the leaves of a shrub called “Chacruna” (Psychotria viridis), giving a brew or sacred drink of psychoactive character that is consumed in a ritual ceremony leading to reflection and cleansing. This brew, named also Ayahuasca, has been used for more than 5,000 years by the shamans of the Amazon as a way to reach amplified states of consciousness. 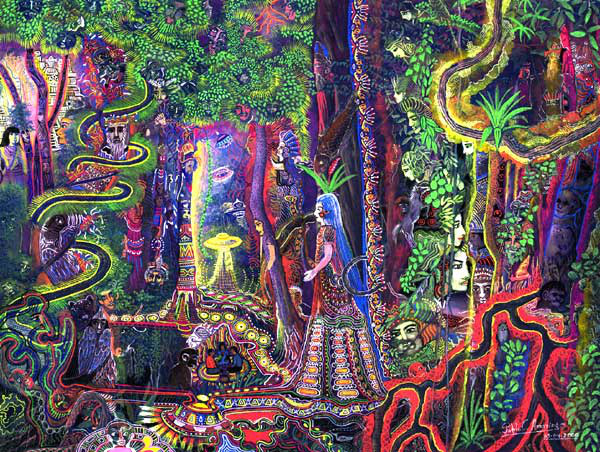 The term Ayahuasca is derived from the Quechua words "aya " meaning soul or spirit and "huasca" meaning rope or vine. This is translated as the cord of the dead or the vine of the soul and is considered to be a drink used by the initiated ones to communicate with the world of the spirits. This brew is considered to be the foundation of the magical-spiritual connection of more than 75 ethnic groups of the Upper and Lower Amazonia. 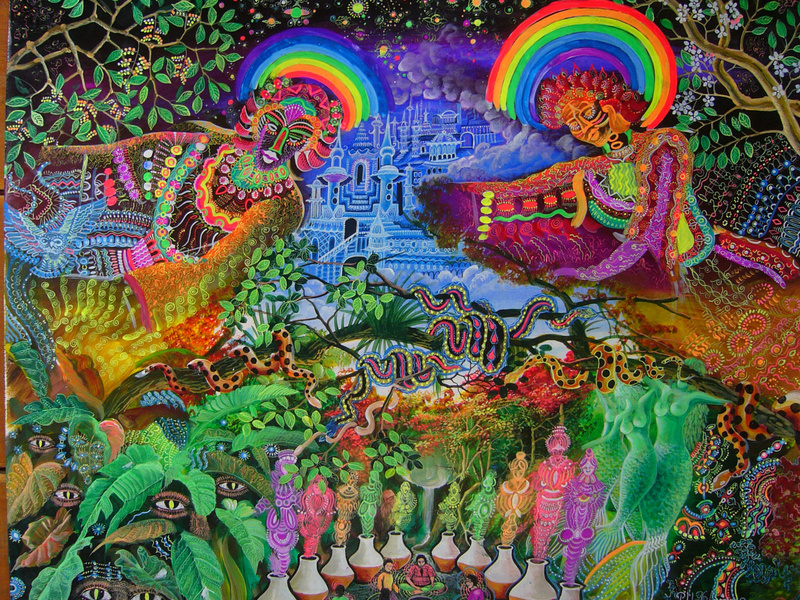 The consumption of Ayahuasca within a controlled context shows no side-effects, it is not addictive and it does not produce any withdrawal syndrome, that is to say that people do not show any symptom of abstinence when they stop consuming it. 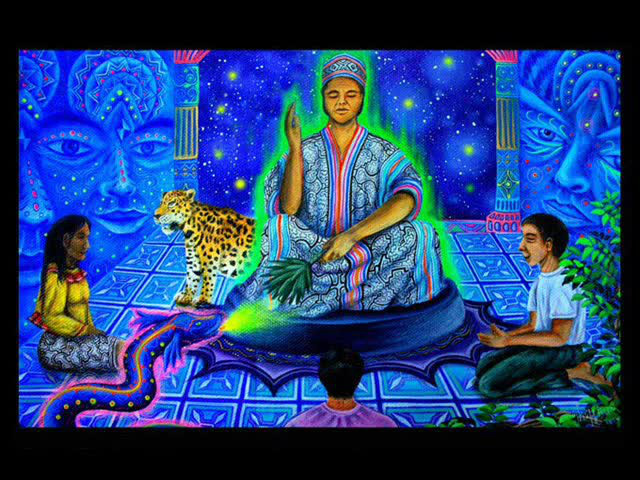 This is a summary of the book "El Ayahuasca - La medicina del alma" (Ayahuasca – The medicine of the soul) published in the internet in July 2002. 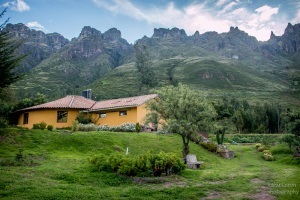 We offer ayahuasca healing ceremonies during the retreats in The Sacred Valley. Welcome to a deeply tranformative, life- changing & beautiful experience and journey! If you would like to join a ceremony in connection with another retreat, we will be happy to assist you an advice you how to and guide you to experienced and safe facilitators. 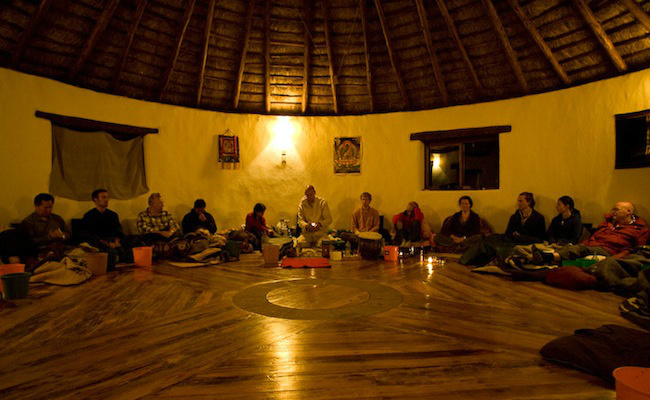 Our fascilitators have many years experience in fasclilitating circles from people around the world & back grounds of being training by a few ayahuasca masters ( curanderos ) from the jungle in Peru), lots of experience in arts, music, healing and energy work. You will journey in a beautiful, love- filled sacred space . The ceremony usually start at between 7- 9 pm and it ends after a few hours. You can stay in the temple till the morning. mantra music, heart songs and medicine songs in English, Spanish, Portugese and other languages. During the retreat, we follow diet around the ceremonies and I offer integration circle and support after the ceremony according to need. We will have a more gentle day before and after ceremony. Many people seek to heal themselves and freedom from physical ailments as well. This is a time when we are blessed with the possibility to heal ailements quicker than ever! We are in a time of quick transformations and mass consciousness shifts. How these shifts are experienced depends on how much baggage and limiting patterns people still hold unto. The indigenous people of Peru are masters in plant medicine and the knowledge has been brought on from generation to generation. They know so much about the plants in the jungle and what each one is useful for. The medicine is known to help to heal addictions, psychic illnesses, physical illnesses/ imbalances and clear out anything that needs clearing and healing at this time. It is recommended and important to look at what areas of one's life one would like healing and set the intention before this work. We recommend a light vegetarian lunch, reducing excessive amounts of sugar, salt and any hot sauce in preparation to receive the Ayahuasca brew into your system. No Alcohol consumption 48 hours prior to the ceremony. Avoid other stimulants, such as Ganje min 1 week before. Avoid eating meat and heavy food min 72 hours prior to the ceremony. Eat an early lunch, and NO FOOD after 1 p.m.
Come with warm comfortable clothes and your water. Before the Ayahuasca Ceremony starts, the person conducting the experience will give instructions that we request to be strictly followed for the well being of all participants. You will be asked to remain silent throughout the night so that everyone can have their own experience in peace and tranquility. We are all working on our own personal issues and it is important to respect your neighbor’s processes as well as your own. We have a staff well prepared to assist any situation that may arise, but the quality of your experience will depend on your commitment to do your work and honor the ceremony as a whole. Healing ceremony in the temple :)..." We come for circle again..."